Pack size: 1 x 90ml bottles & 1 contact lens case. Review Opti-Free RepleniSH Flight Pack Great for traveling. Opti-Free Replenish Very pleased with this solution, first time I've used it, I just needed a small bottle to take in my hand luggage on a short flight. Might actually change to Opti-Free Replenish, seems to make my lenses feel better for longer. Flying and contact lens wearing can be a tricky combination. The hot, sapping conditions of the plane cabin can dry out your eyes rapidly, leading to serious discomfort. That's why it is really important to have products like the Opti-Free RepleniSH Flight Pack to hand. Containing an effective eye moisturiser which is packaged so as not to attract any interest from airport staff, this will be a lifesaver for international travellers. • This Opti-Free RepleniSH Flight Pack from vision giants Alcon utilises the firm's advanced moisturising technique known as TearGlyde. This ensures that a tiny layer of moisture will remain on your lenses for hours, keeping your vision comfortable and pure. 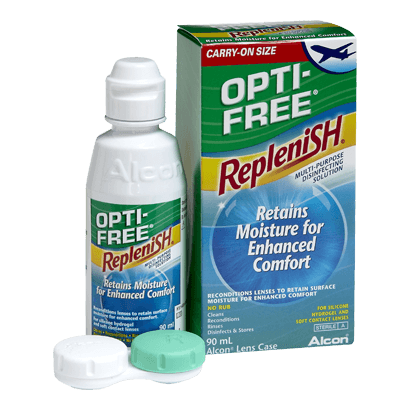 • The Opti-Free RepleniSH Flight Pack includes Alcon's cleaning solution which effectively disinfects and cleans all lenses. • Especially effective for very soft, advanced lenses. • Includes a handy 90ml bottle of cleaning solution as well as the added bonus of a secure contact lens case, which has been specially designed for bathing lenses thoroughly. • Get airborne with confidence, with this cleaning product which lasts longer than its competitors. When you are travelling, every convenience is appreciated. One thing that you won't have to worry about with Opti-Free RepleniSH Flight Pack is your eyes drying out, causing irritation and panic.